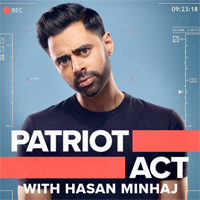 Before recently pulling Minhaj's Oct. 28 Patriot Act episode focusing on the Saudi Arabia regime, Netflix tried to avert a controversy by suggesting that it not be filmed at all, according to The New York Times' Jim Rutenberg. "One person outside the production, who was briefed on the deliberations in real time, told me Netflix discussed potential problems the episode would cause in Saudi Arabia before Mr. Minhaj filmed it, and raised the idea of scuttling it," reports Rutenberg. "This person would only speak on condition of anonymity because of the sensitive nature of the private discussions. An executive at the company, speaking on condition of anonymity for the same reason, said it only shared potential legal consequences with Mr. Minhaj’s team as due diligence, noting it ultimately went forward with the show and its distribution in Saudi Arabia." Meanwhile, NPR's David Folkenflik responded to Rutenberg's report by noting that "Netflix told me it has a philosophy of not pre-emptively ditching content to avert censorship/offending regimes."